Actually, the Morris Minor is one of the finest handling cars in the world, if not the finest. This basket, on an 86-inch wheel-base and only 149 inches long overall, rides better than my Lincoln over rough roads and grooves the corners like a bobsled. In its station wagon form, the Minor almost becomes a major. This little box of bolts has an amazing amount of inside room. In the best American fashion, the rear passenger seat unhinges and folds forward, providing enough level cargo room to haul an embalmed Chinaman and a stiff bull Elk to a firemen’s clambake. With both seats loaded with passengers, there is still enough rear cargo space for a keg of beer and a Coca-Cola cooler. The upholstery is real leather and the car is as comfortable as a $5,000 deluxe American station wagon. My only objection to the car’s looks is its rear truck-like doors, which give it the appearance of a short-order hearse. Our American station wagon doors, split across the middle and opening top and bottom, are far superior—not only in looks, but in comfort and for loading. One of the big gizmos of the American station wagon is the fact that you can leave the upper part of the rear door open in hot weather, thus creating more draft than a jet pilot gets when he sticks his hand out for a left turn at open throttle. Whether you consider it a distinction or not, and I for one don’t, this mechanical squirrel cage boasts the smallest engine now put in an English production car. When we tested the Minor some time ago it had a beetle-size flat-top engine that was as reliable as tomorrow morning’s whiskers, and just as stubborn. The new Morris Minor spoils an overhead-valve malt-mixer and is a dead ringer for the Austin 7 power plant, with a slightly better manifolding and an SU carburetor. This overgrown walnut displaces a bare 49 cubic inches, which means it has just about the capacity of the right lung of a medium-size alley cat. Regardless, this new Morris has more performance than the old rig and gives slightly higher gas mileage. On a trip from Los Angeles to New York you should average slightly better than 40 miles to the gallon, providing you don’t continually push the throttle through the firewall. Zero to 30 averages out about eight seconds, which is not neck-snapping, and top speed is a rather woolly 68. For my dough, this would be a much more attractive car equipped with the Morris Oxford engine which develops 41 horsepower with a full 90-cubic-inch displacement, rather than the 30 horsepower put out by the Minor. Better still, if they borrowed the Morris’ big brother (by comparison) MG’s engine out of the Magnette, I’d order one tomorrow. What this boils down to is McCahill versus the British idea of a small family car. Here is a perfectly magnificent handling automobile, as practical as money in a sound bank, dwarfed by an engine with only a teaspoonful of dig. This is understandable in England where a tank of gas costs more than a couple of bottles of Scotch. But over here if a car can get as much as, say, 30 miles to a gallon, that’s plenty good enough. Trying to squeeze «10 miles or more from a gallon doesn’t impress the average American. He’d rather have a compromise car, if he is interested in economy, that would give good gas mileage (meaning about 30) plus enough dig to beat the junkman’s horse away from a traffic light. Once under way, the Morris Minor station wagon has all the feel of the sedan model, which is tops in anyone’s league. For my test Dave Ash, well-known sports car driver, brought one out from J. S. Inskip, the New York distributor. On my initial run, which took us over many winding and twisting roads, I made better time, in spite of the low overall speed, than I could with almost any American car made. In some down-hill dust stretches, where the road becomes corduroyed and twisty, I held my foot flat to the floor and never once was there a sign of tail break or the feeling that the car might get out of control. On the same road at half this speed a little over a year ago, I lost control of a well-known American car and landed up in a ditch, rear end first. In very hilly country this car required considerable paddling through the gears. The transmission is a four-speed affair and easy to operate, which means that the good driver will not only get a kick out of it but will enjoy whipping the gears in order to stay on the tail of some monster. This picnic basket is big enough for a family of four to take a 3- or 4,000-mile vacation trip at a minimum of fuel expense. It will cruise any turnpike in the country at 60 mph, which is far from embarrassing. It is a lot more comfortable than some hacks available to the sportsman. The steering is rack-and-pinion, two and a half turns from lock to lock. On some of the harder turns where there seemed to be the slightest of body roll, the torsion-bar front suspension kept the chassis grooved like a Gold Cup boat in a turn, but without the drift, In the rear the suspension is by semi-elliptic springs. The shock absorbers are of the hydraulic piston type. A fault I find with this car, where I feel the manufacturer goofed quite a bit, was in its small size fuel tank which holds six American gallons. Even at 40 miles to the gallon this means 240 miles and you are out. My Lincoln, with its 20-gallon tank, can go many miles further and so can most any other American car with a full tank. Big gas economy means other things besides saving of money. It is often important for some drivers, especially those who travel deserted areas, to get extreme mileage out of a tank full of fuel. The Nash Rambler, when properly driven and tuned, will easily go between 500 and 600 miles from one filling of its 20-gallon tank and this is more than twice as far as a Morris Minor will go on a filling. As if this wasn’t enough reason for a larger tank, let me point put that in this day of plenty, many an American service station operator will forget his Dale Carnegie completely when, after he has wiped the windshield and checked the tires, the owner says “Fill it up” and three gallons does the trick. @ Toronto – But not a very appetizing one. 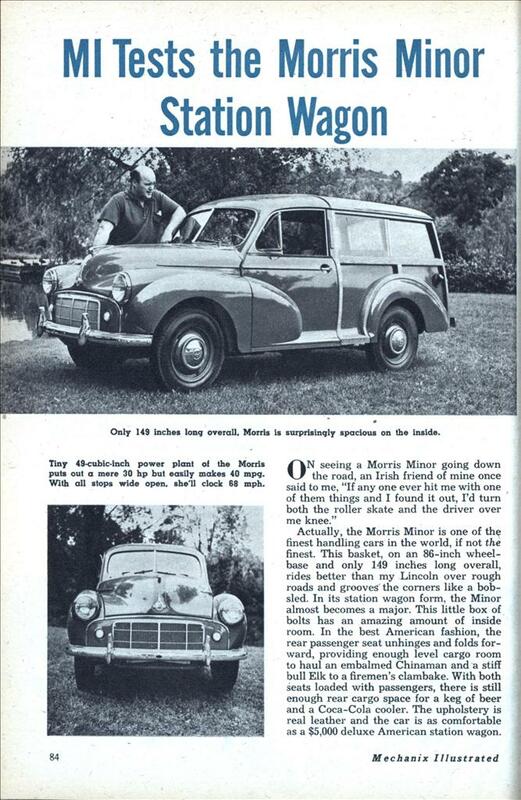 The Morris Traveller, as it was known here, was a famous cheap and cheerful car surviving into the Seventies. It also had well-known faults: that wooden trim used to fall off, and the seam where the two “barn doors” at the back met obscured the driver’s rear vision. A common customisation was to remove the barn doors and replace them with a single door that opened upwards. This kind of over-the-top language by car reviewers still seems to be common. Take a look at any car review on Car And Driver and you’ll see similar expressions (although not racist like this). 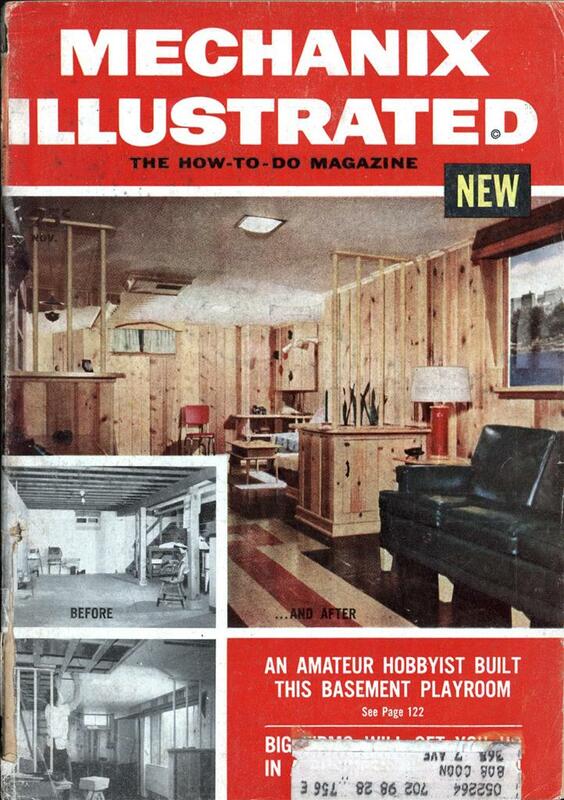 That wooden trim wasn’t trim. It was the structure which supported everything above the floorpan and behind the front seats. Unlike ordinary Morris Minors, which were built in Australia, they were as rare as hen’s teeth here, but I owned a privately imported 1961 Traveller from 1985 until about 2008. In 1957 the 803cc motor was increased to 948cc, in 1961 it grew to 1100cc. With a little work, quite adequate performance for 1980s traffic was possible; a vacuum brake booster in the single brake circuit improved stopping dramatically too. Ride and handling were much better than larger cars of the same era, though they were eclipsed by the Mini when it came along.